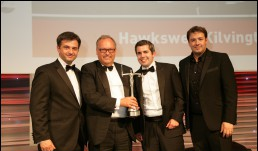 We are delighted to announce that Hawkswell Kilvington has won the Regional Boutique Firm of the Year Award at The Lawyer Awards 2012. Being chosen from hundreds of entrants to win this highly prestigious award is a wonderful achievement for the firm, which celebrated its 10th anniversary in May. The Lawyer Awards are widely viewed as a celebration of excellence within the legal profession and have been described as “the most sought after trophies in the law”. Hawkswell Kilvington’s success in this category confirms that the firm truly is one of the leading specialist construction law firms in the country. Partners Jonathan Hawkswell and Daniel Silberstein (centre) collecting the award.